Almost all modern diseases are linked to food and bad health effects some foods can cause. Whether you research fatigue, weight gain, diabetes, heart disease, cancer, high blood pressure, kidney disease, liver disease, autism or any other disease, there are certain foods that come up as "to be avoided" and others that may help prevent or reverse the situation. A body that is ill and functioning poorly is usually overly acidic - toxic and full of inflammation. Most of these acidic wastes are derived directly from the foods you eat, although some come from drugs, medicines and environmental pollution as well. There is no big secret mystery behind this. The Medical Community addresses most of these diseases with drugs or surgery. And though medications may be used to keep you going, the body's own natural healing rarely takes place. More often, medications are continued "to control the problem" (symptoms). The cause of the problem is not drug or medication deficiency. It is almost always that you are eating or have been eating a Standard American Diet for a long time. So what foods are causing the problem? Some strongly acidic foods that are best to cut out entirely, or at least minimize, are processed foods of all types, sugar (including chemical sugar substitutes), white flour, alcohol, and excessive coffee. Other highly acidic foods are the animal proteins: meats, dairy, eggs and fish. When metabolized they create uric acid in the body. Low in fiber, they can take too long to eliminate. These foods should be eaten in moderation because they create toxic substances that stress the body when eaten in excess. As most people in North America have been eating the Standard American diet, their bodies are usually highly acidic. Bacteria, viruses, fungi, parasites, pathogens and Candida thrive in an acidic body environment. Do you read the ingredient labels? Processed foods are those that have added manufactured items like high-fructose corn syrup, MSG, synthetic colors and flavors or other chemicals, unnatural fats and transfats, thickening gums, GMO ingredients (the ultimate altered foods). These include many "fat-free' and 'low-fat' foods, crackers, deli meats, breakfast cereals - even granolas, soups, fast foods, pizzas, and other packakaged and prepared foods of all kinds, even many health food store prepared foods. Foods are often also processed with high heat, pressure, non-food chemical acids that are then removed, and packaging chemicals, none of which show up on the labels. These highly acidic foods contain little real nutritional value and many detrimental ingredients. When you eat them, you tend to overeat because your body needs nutrients which they cannot provide. Your body strips itself of stored nutrients to try to handle the acids and assimilate them. So you feel hungry. For example, ordinary table salt is mined and bulldozed, and then chemicals are added in processing to "refine" it, including chemical cleaning and bleaching agents, and anti-caking agents. All the beneficial minerals and trace elements that are found in natural Celtic Sea Salt, that make it so tasty and healthful, are removed. Table salt is so detrimental to health that even doctors recommend limiting or avoiding it! The amount of acidity or alkalinity of your body is measured by pH (which stands for potential hydrogen). This is measured on a pH scale of from 0 to 14, with 7 as neutral. Human blood should be slightly alkaline ( between 7.35-7.45). Saliva also should be slightly alkaline, and when saliva is above 7.0 pH, it shows you have alkaline reserves to handle acids. You can measure your body pH by using pH papers. You can get some here. These pH test strips can also test the pH of foods outside the body. But many foods have a different acid or alkaline effect, resulting from the mineral ash they leave inside the body after they are metabolized. 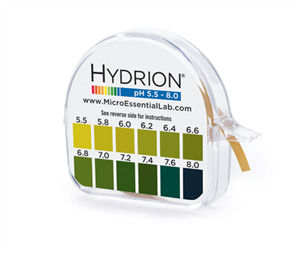 The time to measure your pH is first thing in the morning before you have had anything to eat or drink. Just pull off a 1 -2 inch strip of the pH paper, spit on it, and compare the color of the strip to the color guide that comes with the papers. Any number lower than 7 is acidic and any higher than 7 is alkaline. If your pH is acidic, changing your diet is essential to restoring pH balance for healthy function. Eating a majority of 80% alkalizing foods, and only 20% acidic foods will reverse the over-acid situation. The best way to alkalize is to eat a large amount of fresh fruits and vegetables (80%). And limit acidic foods to 20% of your diet. As it might be too difficult to make that change in a day, start changing your shopping habits, clean out your pantry and plan to gradually increase the fruits and vegetables, while lowering the acidic foods on the "to be avoided list". A counter-balance of vegetables and fresh fruits is best to provide fiber and micro-nutrients, and these will help to move heavy protein food wastes out of the body. Alkaline/Acid 80/20 Chart You can use a chart that gives the most common foods and their pH values along with all you need to know to alkalize your body using diet. You will love this chart! Now, you have half the solution. The other half involves cleansing, because if your body is acidic and toxic, it is overloaded with unexcreted acid wastes. While you work on improving the pH balance of your body through diet, you should also rapidly detoxify your body of its acid overload. This will make you feel better, reset your balance point, reduce cravings, and make it easier for you to make diet changes comfortably. Otherwise, the unmoving toxic substances end up being reabsorbed and stored in body fat or circulating to all your organs via the blood stream. As body organs become overloaded with toxins they cease to operate efficiently. So the second and equally vital part of achieving a proper pH balance is to cleanse your body organs one by one starting with the intestinal (including colon) cleanse first. We offer a number of intestinal cleanses. They are all made with natural organic and wild-crafted herbs right here in the USA. All our cleanses have a proven record of success. If you are first-time cleansing, we recommend you start with the Complete Intestinal Cleanse program for best result, then move on to liver, kidney and then blood & lymph cleansing. After your intestines are cleansed, the other organs can be handled one at a time. This is a full handling of pH balance and the start of a whole new healthy you. For more information about How to Cleanse and Detoxify your body, choose from the Guides below. To find a complete list of our Cleanse programs and products, click on the button. If you are want more information, or have questions about what the experience will be like, please feel free to contact us by phone or email. We will be glad to help you.